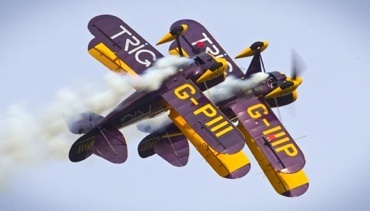 AeroExpo UK is excited to announce that the Trig Aerobatic Team will be performing at this year’s event between 13:30 and 14:00 on all three days of the show. Flying only 5 feet apart, their high-G manoeuvres subject Richard and Dave to gravitational or ‘g forces’ of up to +6 g and -4g. Precision flight under such conditions underlines these pilots’ extreme skill and professionalism.